So I went to SharePoint StackExchange and asked the question. Then I realized: the standard Sharepoin API doesn’t support this neither. 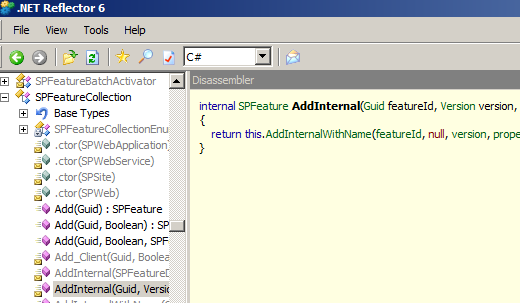 The methods of SPFeatureCollection which have SPFeatureProperties as parameter are internal. So the only way is to use Reflection like Hristo Pavlov (2008) and Yaroslav Pentsarsky (2010) suggest. So why not to try to create a cmdlet? First I create a simple cmdlet just to get started. Then I test the reflection code to activate a feature with properties. Then, if this works, I will bring the pieces together and create my cmdlet. The best cmdlet tutorial (text, images, code and videocast) is created by Saveen Reddy. I just followed his sample. I created a new class library project and a class for the demo cmdlet: Get_DemoNames.cs. The parameters which have to be passed to the internal add method are changed, too. Pay attention that we have to run installutil.exe from Framework64, not Framework. Otherwise the pssnapin won’t be accessible. Of course, in order this to work, we have to deactivate our test feature first. 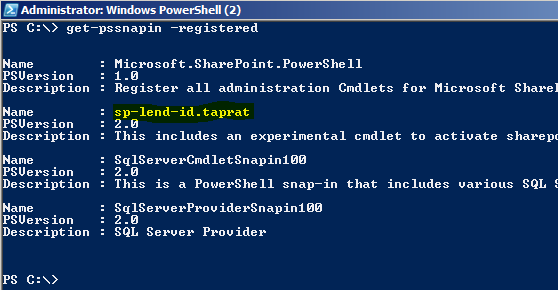 Then the cmdlet activates our test feature which only updates web title in this experiment. It works. Splendid!